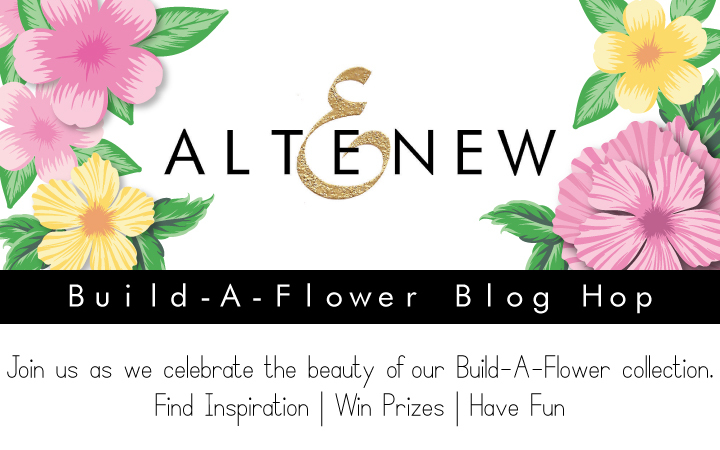 Welcome to the our Build-a-flower blog hop. 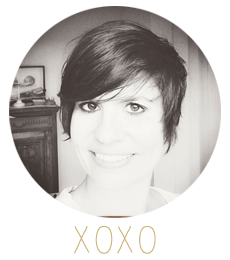 Have you come from Therese Calvird's blog? Well, you are right on track! If not you can start the hop over on the Altenew Card blog. The Altenew Design team and guests have teamed up to celebrate the Build-a-Flower series from Altenew. I chose you the Carnation set to create a card. I started by stamping the carnation flowers at the bottom of my card base using a mask so that I could overlap the flowers. Then I added some leaves and stamped a couple of details to the sides and on the top part. I finished it off with the Thinking of You stand alone die. There are three giveaways for this blog hop. I'll be giving away a 20$ gift voucher to the Altenew store. All you have to do is leave a comment below in the COMMENT section. 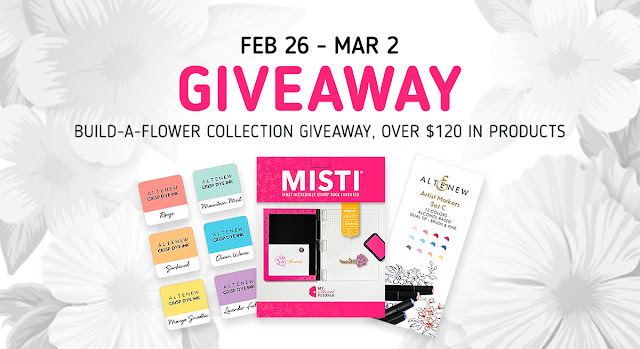 I'll pick a lucky winner on March 2nd and announce it on my blog that day too. So what is your favourite Build-a-Flower set? Love the Carnation. I had not seen that one yet. Thank you for the inspiration. Very beautiful! Love the Build A Flower sets! I need to try this carnation stamp. Lovely card. Very pretty! I love the diecut sentiment! Love these flowers builders, I just bought 2 of them. Now I need to find crafting time! Those flowers look so realistic! Absolutely gorgeous card! Love those beautiful carnations & your great design. Very inspiring! Lovely card! My favorite build a flower stamp set is the anemone, they are one of my favorite flowers. Thanks! Such fun! Thanks for sharing. Beautiful card. Simple and elegant. Thanks for sharing. The Carnation Build-a-Flower is my favorite! Beautiful card. Very beautiful card. I love the whole series. My favorite is the Rose which I am hoping to add to my stash this year. Wow! I can't believe the level of detail on that flower and the ink colors you chose are just perfection. Thank you. Lovely card, I like the way you did your striped background. I am new tp the flower builder stamp sets and have just ordered my first two, Anemone and the Carnation sets. Pretty card. These layering sets are amazing. What wonderful card you made. Love carnations and your colors are a wonderful red! You did an awesome job on your card. Thanks for sharing and have a wonderful week. I love your bright red carnation on this card! Beautiful! I'm gonna say the build-a-rose is my favorite since its the only one I have, so far. But I want them ALL! Your card is beautiful. The bright colors are quite eye-catching. The white with the bright flower is sooo very pretty. The bright flower with the white is so pretty. Lovely card! Love the punch of red. I really like the carnation set, I think of it as a bit retro - carnations seem to be back in fashion again. The colours are so vivid on this card! Gorgeous design. I love the grounding of the card with the bold colors. Beautiful card and I love the colors! I love your card. Love the flower and the background. I like the flowers at the base of the card. Very pretty. Lovely card. I love this flower set! The carnation is my second favorite one. Your card is lovely using it. Beautiful card! I love the colors you used for the carnations! The 'thinking of you' die is already on my wish list (waiting for it to be in stock again!). Beautiful colors for your card! I can't pick between the carnation and the rose sets. Love the red carnations! Thanks for sharing! Wow, I didn't even know Altenew had a carnation set. Thanks for sharing. 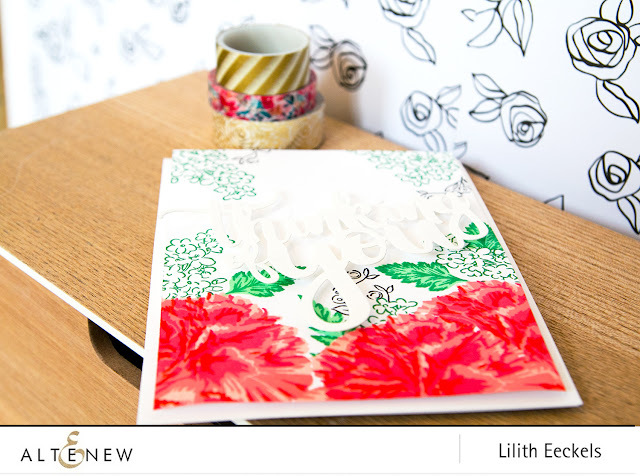 wonderful design, Lilith - lovely card! This is so stunning!! The colors are amazing!! What a gorgeous card!! Love the colors you used for your card. Thanks for sharing! Very pretty. I like the bright orange. Beautiful card. Thanks so much for sharing..
Beautiful colors on your card! I don't think I've seen the carnation Build-A-Flower before. It's quite pretty! This feels very different from some of the other cards, and I'm not sure why. Maybe it's because of the open flowers that you stamped in color towards the top? Maybe the bold/subtle combo of the sentiment? Whatever it is, I like it. I also like the bamboo roses on your wall behind the card. A whole Altenew theme! Thanks for sharing and participating in this bloghop. Love the carnation set but haven't yet purchased it. Love how it looks. Pretty carnations - I love carnations but I think my favorite Build a Flower set is the Peony. Such a beautiful card! Love the colors you chose! Love the placement of the carnations and other flowers leaving space for the die cut. Lovely card! I love how you set the flowers at the bottom edges. Great design. A bright and happy card! Lovely color choices and composition. Thanks for sharing. Wonderful card using a wonderful stamp set. I love the detail in the carnation set. It just looks so lifelike. Your color choices helped with that even more! These Build a Flower sets are so sweet. 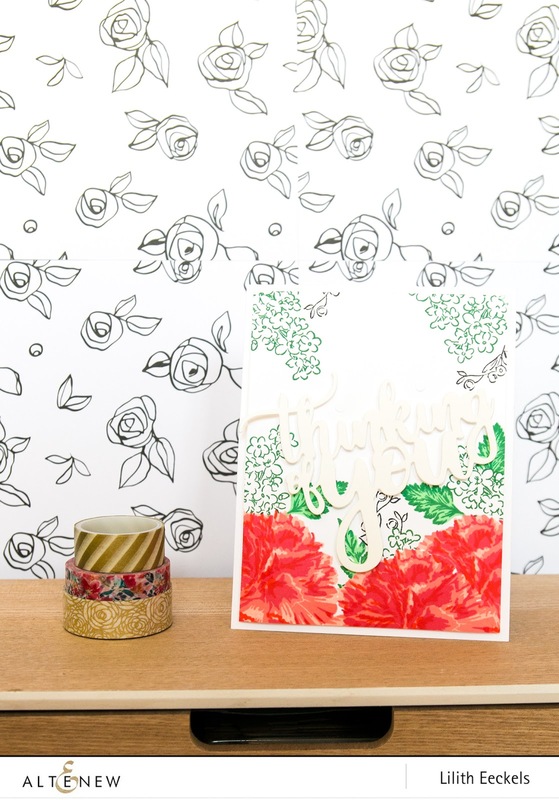 Love the pop of red in your lovely card. Love this build a flower - I am a chemo card maker and my assignment loves carnations - so I will definitely be picking this set up. BEAUTIFUL card! That's such a fun design. Love those colors with all that white. Your card is awesome. I like the red flowers. Just the simplest layout beams with these beautiful blooms! Love yours and the bold colors! The carnation is so gorgeous and the color is so rich. Loved it. I am so excited because spring is 21 days away and I definitely have flowers on the brain right now. them as they stay fresh for so long. Oh, dear me, I want this carnation set so badly. It is just incredible. And so is your beautiful card sample. Thank you. Lovely card! I don't think I've seen the carnation set before. It's very pretty. Beautiful carnation card. These build a flower sets are so cool. 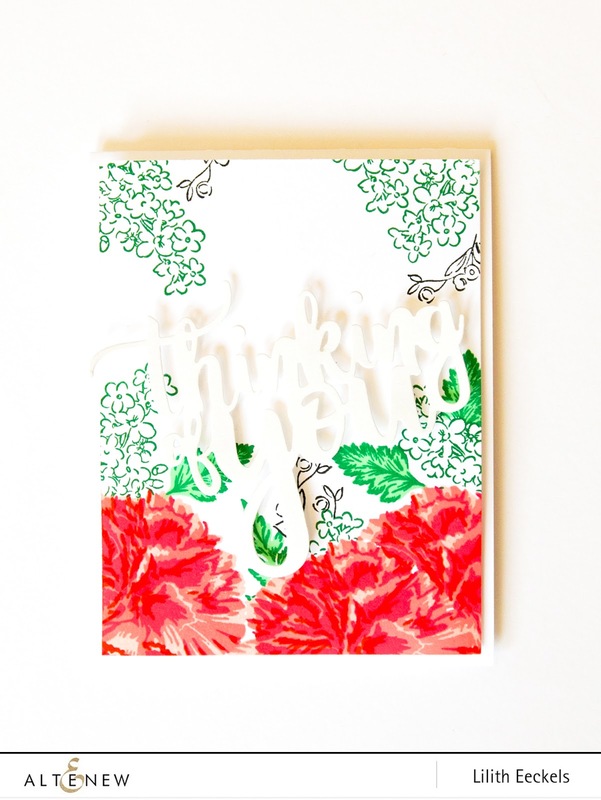 Such a pretty card - I love the carnations and the pooped up sentiment. Beautiful RETRO colors on your card today!! Beautiful card. Your flowers and colors are beautiful. Beautiful Carnation. Your colors just pop. Thanks for sharing your inspiration. Fab card with lovely colours. Thanks for sharing. I love all of the build a flower stamps. This one is especially lovely. Thanks for sharing. Very pretty. My favorite set is the carnation set. Lovely card! Thank you for sharing. Beautiful carnations Card, love this design. My favorite build a flower set is the cosmos. My favorite is the rose, but your carnations have come in a close second. Wow. Pretty card. Thank you for sharing. Wow, love the constrast between the intense red carnation and the green leaves! Beautiful card! The Rose build a flower set is my favorite! But the carnations are lovely too! Very unique card! Love the carnation. Beautiful card! Love the carnation stamp set.. I have it and can’t get enough of how it looks when fully stamped. Beautiful! Love the cheery colour of your carnations. I love this collection! Love the colors you used on the carnations! So pretty! Love the brilliant red flowers! TFS! Wow, those carnations are stunning! Love your design. This is so beautiful! In real life I don't see Carnations as a beauty, but yours is splendid! The carnations just pop out, like "Hey! Here I am! Look at me!" Gorgeous! Love your color combo! I love the green and red color choice. The green makes the carnations stand out. Such a pretty card. I love how the flowers ground the card and the white on white sentiment. I love that you did the Carnation! It is my birthday flower & I hadn’t seen that one done before! I love to watch all of your videos! Thank you so much for taking the time to answer all of our questions & just make the videos!